Andrew graduated from the University of East Anglia in 1990. Whilst there he was Organ Scholar at Norwich Cathedral and he worked with the Norwich Philharmonic Choir and the Aldeburgh Festival Chorus. In 1990 he moved to study Organ and Early Music at the RCM, directing the vocal ensemble Nouve Musiche. 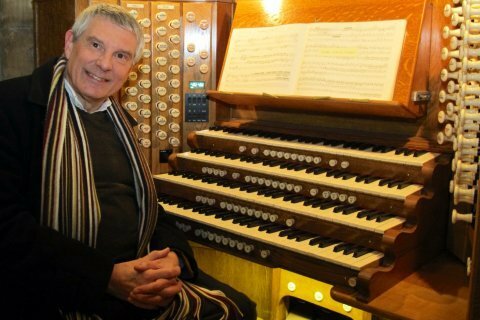 He became Assistant Organist at St Martin-in-the-Fields Church, Trafalgar Square in 1991 making regular broadcasts for BBC Radio and Television and directing the St Martin’s Scholars. Currently Andrew is Head of Music at Cams Hill School, Fareham, Director of Music at St Peter’s Bishop’s Waltham, Musical Director of Portsmouth Military Wives Choir, and Musical Director of Fareham Philharmonic Choir and Orchestra. He has worked as Organist and Music teacher at Pangbourne College and Oundle School, when he directed the St Peter’s Singers in Peterborough. He subsequently held posts as Director of Music at Dean Close School, The Portsmouth Grammar School and Christ’s Hospital. In 2003 he founded and became Musical Director of the Portsmouth Cathedral Girls’ Choir. He conducted Katherine Jenkins and Bryn Terfel as part of the Royal British Legion Festival of Remembrance at the Royal Festival Hall in 2005 and the Portsmouth Grammar School Choir at the Drumhead Ceremony to mark the 200th Anniversary of the Battle of Trafalgar on Southsea Common.